Yarn Geek Heaven: Idle Hands Giveaway!!! Who doesn't love a giveaway? I have only had my shop actively open for a few short months. In that short period of time, I have had a fabulous launch and have been fortunate enough to make many new friends. To celebrate 50+ Facebook likes, 100+ Twitter followers, 70+ sales in my Etsy shop, and 130+ favorites of my Etsy shop, and to promote a series I am writing this summer for the Love2Upcycle blog for the Upcyclers team on Etsy on demystifying t shirt yarn, I am having a giveaway! The giveaway is being done through Facebook. Sorry Facebook haters, but it was the best way to do this one. Entering is super easy and a little addictive. The giveaway will start on June 3 and go through June 30. I will post the link once it goes live. So how do you enter? Well, you go to my Facebook page and click on the "Sweepstakes" app under my bright banner. It is next to the "My Etsy Shop" app. You like my page and it enters you. You must click the "Sweepstakes" app to be entered, but if you just want to like my page that is awesome too! The app selects a winner at random and notifies you (and me) through Facebook. You then give me a shipping address and I go to the post office. 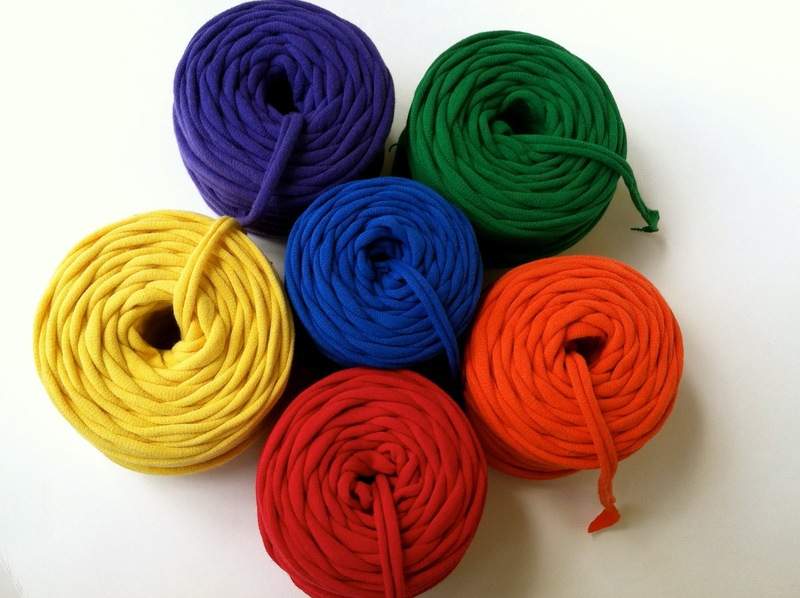 That's right, 189.25 yards of a rainbow of t shirt yarn sent to you at no charge! With shipping, that is about a $45 dollar value. My gift to all of you who have supported my shop and to new customers. I'm also announcing an exciting new shop section. Starting today, I will have bundles of t shirt yarn for sale in my shop! These bundles will include the rainbow of yarn package you see above for the giveaway. They will also include neutrals (white, light grey, dark grey, and black), pastels (pink, blue, yellow, green, peach, and lavender), neons (pink, green, blue, purple, and orange), and earth tones (tan, brown, earthy green, earthy blue, and earthy burgundy). I am very excited about being able to put together collections of t shirt yarn that will blend well together. This section will also include lots of yarn taken from event t shirts destined for the dumpster and crying to be rescued! These t shirts are brand new left overs from events. The color and texture will match perfectly because the shirts are all made from the same dye lots and fabric textures. It is the perfect solution to that large project you have always wanted to do in a uniform color and texture. I am also always happy to work with customers and help them design an order of yarn to fit a specific project they are working on. You can contact me directly through my Etsy Shop, Idle Hands Yarn Supply, by clicking the blue contact button on the left side of the page under my name. Today you will see a rainbow bundle and a neutrals bundle go up. Pastels, neons, and earth tones will go up as the week progresses. The rainbow and neutral bundles going up today will be in a 4 WPI, but these same bundles will also be done in 8WPI as I continue to put this line out. As always, there will be a wide variety of single balls of yarn for sale, including some more tie dye and hopefully some stripes. I am hunting to find some of those beauties. I hope you enjoy the bundles and will read the series on the Love2Upcycle blog! I will post an article soon detailing the series and the schedule and will post links to the articles as they go live. Thank you everyone for your support through these months!